As a leader in Business Analysis, Saratoga is proud to be a sponsor of the 2018 BA Summit taking place in October. The theme of this year’s summit. ‘Transforming Business to Realise Value’ promises to deliver great insights and talks from leaders in the Business Analysis community. “The pace of organisational change is constantly accelerating, driven by advances in technology and a shifting global business paradigm. The Business Analysis profession is uniquely positioned to make sense of this change, its business impact and how organisations and their systems need to adapt”, Mark Gebhardt, CEO at Saratoga. As an organisation, it’s a priority for us to not only invest in our business analysts, but also to invest in the greater Business Analysis community. “We are delighted to continue our long-running involvement with the BA Summit which provides a key platform in the South African business landscape where BA’s can engage, understand and learn in order to better shape our responses to this change” adds Gebhardt. “Saratoga is proud to continue our support of the BA community as a sponsor of this year’s BA Summit. Our investment in using Business Analysis as the foundation for our Business Consultants ensures that we have the skills necessary to adapt to a changing technology environment. Business Analysis is not just about IT projects, but provides the foundation for our Business Consulting team and ensures that they have the tools and context to create great customer experiences” believes James Neethling, Business Consulting Competency Lead at Saratoga. Join us at the 2018 Business Analysis Summit to discover how organisations, in partnership with the Business Analysis profession, can embrace change and transform businesses to realise value. 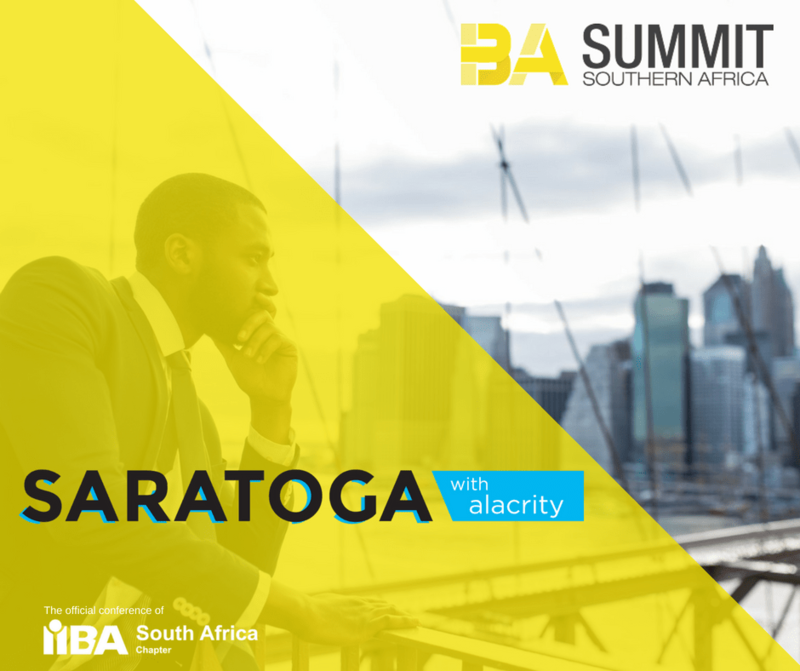 Connect with Saratoga at www.saratoga.co.za or follow us on @SaratogaSA for business analysis insights and highlights from the summit.